As promised, the teaser for "The Adventures Of Tintin: The Secret Of The Unicorn" is here, and like everything else that's been released--photos, posters--it's maddeningly coy. That said, it looks pretty good. "The Adventures Of Tintin: The Secret Of The Unicorn" follows Tintin, Snowy and Capt. Haddock as they discover map that will lead them to a sunken ship once under the command of one of Haddock's ancestors. The story is a combination of the Tintin adventures "The Crab With the Golden Claws," "The Secret of the Unicorn" and " Red Rackham's Treasure." 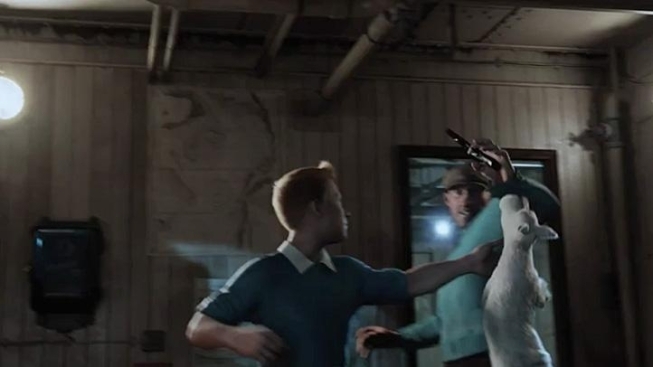 The clip still doesn't give us a really good look at Tintin until the end, and even then, we don't get to see his face move, so we still don''t know if Spielberg has been able to scrub off some of the creepiness about motion-capture animation that bums us out. But everything else looks great, so we're hopeful. Yesterday brough tthese great two posters, the one on top for the U.S., the other for the U.K. The cast features Jamie Bell in the lead, Andy Serkis as Haddock, Simon Pegg and Nick Frost as Thomson and Thompson, and Daniel Craig as Red Rackham. "The Adventures Of Tintin: The Secret Of The Unicorn" opens Dec. 23.